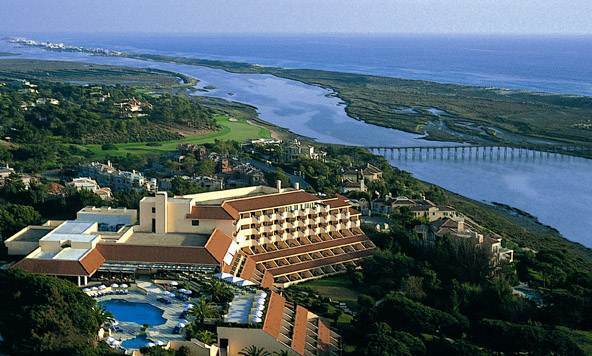 This has become one of the most prestigious holiday and golfing paradises in Europe and possibly the World.Situated on the huge natural park known as the Ria Formosa;it has one of the most idyllic settings on earth.. It is served well by the town of Almancil which has benefitted greatly by the existense of this high quality resort. Quinta-Do-Lago sits on this stunning lagoon and yes,the skies really do get that colour here.Being right on the edge of the Ria Formosa natural park,there is so much one can do.There is literally something for everybody!.Principally it is a golfing community but there is nothing stopping you renting or buying real estate on this secure site and taking advantage of its exclusive services and the surrounding natural beauty. The hotel itself as you might well imagine is very impressive and the epitome of luxury and quality.This really is some of how the other half live. The bedrooms enjoy views overlooking either, the Atlantic Ocean, the Quinta Do Lago golf course or the Ria Formosa lagoon. You can choose from a Classic or Premium room or one of the hotel's Suites. Facilities include a state of the art Spa with a heated indoor pool,massage parlour and sauna. Then a very popular Turkish bath, treatment rooms and gym. However during the warmer months you probably will wish to relax in the outdoor jacuzzi and enjoy amazing views out to the Ria Formosa with an excellent chance of seeing one of the fabulous sunsets so often hanging over this Atlantic Paradise on the "Coast of Light"
The Hotel Quinta-Do-Lago works hard to make sure it has something to suit everybody.So is an ideal destination for families as well as keen golfers..No better setting could be found for a romantic holiday or a relaxing break for the retired. As with everything else on this luxurious resort the golf is superb and you can get some idea of the size of the site it having four golf courses within its boundaries.If looking to stay and play golf you can make all arrangements before you arrive as the hotel has a very usefull golf desk. This course is of such high standard that it has hosted the Portuguese Open Championship no less than eight times. The American architect William Mitchell designed the course to a very high specification.It was inaugurated in 1974 and is 18 holes with a par of 72 over 6488 linear meters.The course record is held by the Scot Colin Montgomerie who recorded a very commendable 62 in 1989! There are plenty of water hazards;with lakes involved on 4 holes.Over the years it has generally been agreed that holes 8,10,15 and 18 require the most all round skill to hold par.It is still a firm favourite with many tour players . Quinta-Do-Lago South is 6,500 linear metres and is a par 72 course set in amongst umbrella pines, lakes and indigenous plants.With stunning views of the amazingly beautifull Ria Formosa in the background. You might have guessed it is not an easy course with great accuracy needed as it winds through the trees.There are many hazards especially if you drift off the correct line and there are numerous dog leg holes to spice it up a little..we shall have a brief look at the other courses on the Quinta-Do-Lago resort.The address and phone number are the same as that listed below for the North course. The picture graphic above shows you some of the terrain you can expect on Quinta-Do-Lago golf courses;of which there are 4.You will find wooded lanscapes of mature pine trees.You will find rolling countryside and plenty of sand and water hazards.All making to very pleasing atmospherics for the golfers. 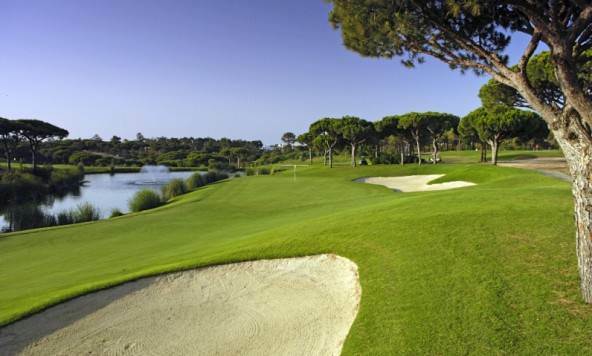 Address:Quinta Do Lago 8135 Almancil,Algarve,Portugal. It is an 18 hole par 72 course over 6205 linear meters.Not quite as grandiose as its neighbour Quinta-Do-Lago North,it is still very fine as GOLF-COURSES go.Running through large pine tree woods great accuracy is required at all times.Power is needed on some holes to keep a good score going.Some complain that there is rather a long walk beteen many of the holes and that the course is lacking in great views.However others do not always agree,I guess it is all in the eye of the beholder.Maybe the south course took all the best spots.There are four good par 5 holes and 11 par 4,s ,all of which have a dog-leg involved except for number 10 and number 13.Water in the form of lakes is involved on holes 13 and 18. Quinta do Lago North Golf Facilities as you might well expect are excellent.They include a fantastic driving range,along with both a putting and a chipping green.They have a golf acadamy,a professional golf shop and of couse the inevitable restaurants and bars. Green fees are fairly expensive but not so when you consider where you are playing and the class of everything,from the perfectly kept fairways and greens to the attentive and generally knowledgeable staff. euros 55 for 18 holes;or euros 32.50. Hand Trolley for 18 18 Holes is- €uros 7.00. Club Hire for 18 Holes - €uros 40.00 // 9 Holes - €uros 25.00. There are many activities to keep one amused during a long stay .There is a watersports centre on the huge lake,where you can try out various sports. Then there is a horse riding centre and fishing is available on the lake to;many different fish can be caught. Watersports are one of the main attractions on the man made lake originally installed to irrigate the golf courses and gardens..So one benefit is the wildlife that comes with lakes. These pedal boats are rather a relaxing way of getting out on the water to see the wildlife close-up. Fortuneately these lakes were made large enough to give lots of space for Sailing and Windsurfing. For the less energetic there is a very posh (pricey! )Restaurant on the edge of the lake for you to watch the sailors and wildlife enjoying the wonderfull Quinta-Do-Lago sunshine. Not feeling energetic? Pockets empty? Well we got that covered to! 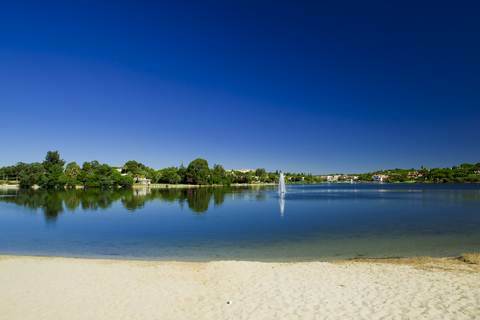 Sit on the little man made Quinta-Do-Lago beach and watch the wildlife and the "sporty types" wear themselves out!You can tire yourself out getting that super Algarve tan.Make sure you adjust the parasol and put the factor @@!1? ?+ (whatever!) on before......yawn....going to....yawn!.....and ENJOooooooy. Ah,hello,awake again!Wake yourself up before dinner with a visit to the quite amazing Almancil Church.In fact some go so far as to describe the inside as "quite breathtaking"!.The church of St Lawrence is stunningly decorated with hand painted tiles,depicting scenes from the life of St Lawrence.St Lawrence committed the heinous act of giving the church' money away to some citizens who "could use a little cash",sometimes known as "poverty stricken"!For this misdemeanour the poor Saint was tortured and burnt alive!Let that be a lesson to "all ye who dare visit"! It is worth visiting as the artwork is "magnificent to behold". You might like to try and solve the puzzle that has defeated millions of tourists throughout the ages.Were the tiles painted and delivered to the church.Some say that would be a heck of a puzzle but I say,not if the artists numbered them on the back.Eh? Come on! Would you have thought of that!Honestly!I was the first to put it in writing!So there! The alter is intricateley carved and gilded and is spectacular to behold.It is worth the small entrance fee and will take around half an hour to explore inside.They do not allow photographs to be taken inside,you gotta' buy the official pics'.In Almancil, Quint-Do-Lago.